Your CV is one of the most important parts of the job application and a great CV can make or break your application for your dream job. Love it or hate it, your CV is a paper representation of who you are and what value you can bring. 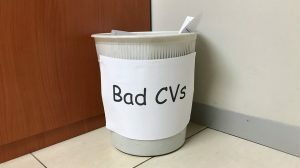 While it holds so much importance, it also takes a few seconds to evaluate and disregard a bad CV. Let’s look at what can you do to ensure that your CV is actually read and that your value is communicated effectively. There is no need for fancy fonts or colours or images in your CV. Anything that makes your resume hard to read or understand can make the receiver ignore it within a few seconds. Job applications often yield hundreds of CV’s and recruiters or hiring managers don’t have time to try and decipher your code to understand what your value is. Keep it simple and make it easy for the reader to see what value you can bring. A good heading helps the reader identify where the necessary information is. If we want to see your education history, a clear and bold heading will tell us where it is immediately. If you don’t know how to use heading styles in your word processor we suggest you find a way to learn how as this makes formatting your CV easy and consistent. Always order your history from the most recent. The CV is not read in-depth on the first instance so it is up to you to draw attention to what will help you land that interview. List your most recent work experience first, and your highest qualification first. To PDF or not to PDF? So you want to preserve that fancy alignment you have created and make sure your fonts are correct for the read. However, there is a reason why most recruiters ask you for a word document CV, and that is computers. At multiSEARCH we have a sophisticated system that helps us keep track of applicants and this system allows us to search through all of our CV’s to find suitable candidates based on the information you have provided. These systems prefer Word documents as they are currently easier to “read” by the system. The system also benefits from simple CV’s and heading tags placed in the document by the heading styles and makes categorising you for a perfect job just that little bit easier. Work experience can’t effectively be measured by time alone. You could have sat in the same job for 10 years and never improved meaning you don’t have 10 years’ experience; you have 1 year experience 10 times over. What can differentiate you from other candidates are your achievements in the role. Did you save the company significant money? Were you the top salesperson? Having this on your CV will also help in the interviews as it gives you an opportunity to talk to the interviewer about them and essentially make your case that you are the best candidate for the role. A photo can help you stand out as well, considering that you need to present yourself accurately in the picture. Watch the video below as we discuss why we like the photo on a CV. It is vital that you keep the reader in mind when crafting your CV. A simple layout will also allow you to adapt it for different companies should you wish to highlight different factors that make you stand out. Remember your CV is your marketing brochure and while it is tempting to stand out using design, it is more effective to try stand out using your achievements. If you are at a loss of where to start, here is a template to help you get going.